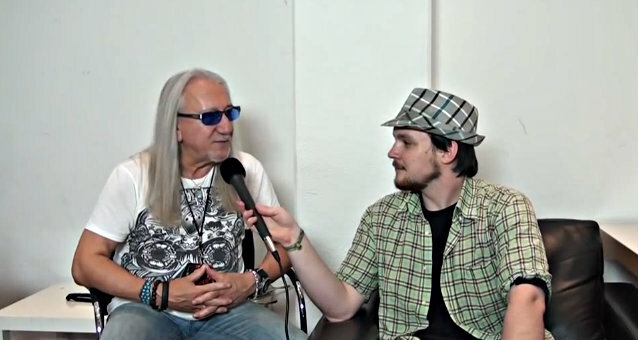 On November 12, Metal-Trails.com conducted an interview with guitarist Mick Box of progressive rockers URIAH HEEP before the band's concert in Hamburg, Germany. You can now watch the chat below. Originally founded by Mick Box in 1969, URIAH HEEP is truly one of the pivotal classic acts that helped define the rock sound and an era. Part of the fabled "Big Four" alongside LED ZEPPELIN, BLACK SABBATH and DEEP PURPLE, the HEEP story still has a long way to go. With classic songs like "Lady In Black", "Gypsy", "Easy Livin'" and "Stealin'" full of ambition, sophisticated writing, memorable tunes and, of course, the vocals — the five-part harmonies were a clear influence on the operatics of QUEEN.